Protecting yourself comes first before you could protect others. Guess what? It would be hard to protect yourself without any weapon at all! These reviews will help you pick the best self-defense knife. In the world we live, it can’t be avoided to experience dangerous situations wherein other people may wish you harm. Nobody wants to be a victim so we should be ready to arm ourselves. Having a self-defense knife is the ideal precaution. So, I have gathered the most ideal knives in this article along with some valuable pointers. Ka-Bar is a household name for tactical knives popularly used by military and police forces in the United States. And you should too! With more than 100 high-quality tactical knives under the brand, this self-defense weapon will surely be your indestructible lifeline should you need it. The TDI Law Enforcement Knife is a fixed blade knife with a blade length of about 2.3125 inches and overall length of about 5.625 inches. 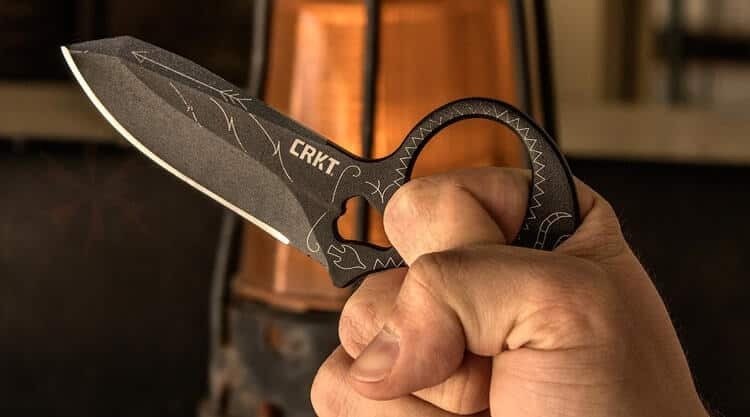 Despite its small size and unusual shape that makes it a karambit knife, it’s quite common for an officer to have this knife as his secret concealed weapon should he be disarmed. When you use this karambit knife, your mechanical energy channels into the knife making each of your slashes and cuts dangerous and lethal. Expect deep and painful wounds in the part of your adversary when you’re able to cut him with this knife! I find this one a real weapon in close combat. There’s no way the attacker can disarm you thanks to the pistol-like grip design you can interchange with both hands; and you’ll still feel natural! The finger grip near the blade is for your index finger so you can position your grip with good control. You can use the knife in any position you’d like, depending on your tactics. This one is made of stainless steel metal; your knife won’t rust easily due to the black coating, but you will need to sharpen it regularly. Also, this knife is purely designed only for self-defense and nothing else. Furthermore, this karambit knife would be hard to use if you intend to make it as a utility knife. Because of the design, the knife won’t do too well for stabbing; however, I find it ideal for slicing. You’ll like how the handle material comprises of impact-resistant patented thermoplastic called Zytel. Zytel is unbreakable making your knife more formidable. Ontario Knife is one of the oldest brands known for their knives ranging from cutlery, survival, field dressing to tactical. They have lots of types in their arsenal, and all their knives are authentically made in the US. Take for example this Ontario Ranger RD6; you can guarantee a great fixed blade knife with this one! For starters, this knife is one of the longest in our list with an overall length of 11.75 inches. The blade length made of 5160 Steel (an alloy steel composed of carbon and chromium) is 6 inches. The tip has a convex shape which makes the knife identifiable as a clip point blade. The metal used is an alloy steel with traces of chromium for more rust resistance, silicone for improved toughness, and a larger carbon component for knife durability and sharpness. The steel that comprises this knife is something you don’t want to underestimate. Matter of fact, the 5160 is a steel used to make swords! Furthermore, the blade is coated in black for a nice finish. Not only great for self-defense purposes; I also find this tactical knife ideal for use in the wilderness to cut some branches, field dress an animal, prepare game, and the like. Since this knife is clip point, I can easily slash and pierce objects. There’s one thing to keep yourself reminded of. Unlike drop point blades, you must observe proper care first, so you won’t hit the tip on a sturdy surface and unintentionally break it. The knife surely looks deadly with its size and capabilities, but it still has some downsides. As a self-defense knife, concealment would be a bit difficult but still sustainable. A preferred location for your concealed carry could be inside your waistband. Additionally, the handle could be a bit large for female users. The ergonomic handle is made of Micarta. It is a linen that has multiple layers soaked in a phenolic resin that make the material lightweight yet quite sturdy. Since Micarta has no ‘texture,’ you can feel maximum smoothness when you grip the handle. Micarta is a masterpiece made by hand, making it expensive but worth the price. Initial impressions include the karambit knife being small. However, it’s lethal and packs quite a punch. I like how the Matriarch could deliver a superb cutting performance you can depend on to do some cutting and slashing, especially in close quarters combat. This is your ideal self-defense weapon; it’s virtually impossible for someone to disarm you without being injured first. All thanks to the pistol-like handle having an ambidextrous grip that makes it possible. ​Its stainless steel blade is about 3.55 inches out of the 8.39-inch overall length. Moreover, the length would then be about 5 inches when you fold it. Since it’s pretty small and lightweight, I was able to conceal it in my IWB holster effectively. I also find it fitting in my breast pocket. ​I also appreciate how the Matriarch is a folding knife employing lockback mechanism. ​Unlike other knives having plain edges, this one featured a serrated edge. If you hit the flesh with multiple slashes, expect the flesh to receive lots of damage as uneven cuttings will hit more veins than just neatly slashing it. 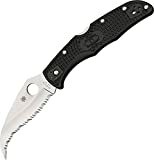 ​Other features of this knife are a four-position clip and Spyderco’s Bi-Directional-Textured™ fiberglass-reinforced-nylon handle. Benchmade is one of USA’s top knife manufacturers, and they specialize in making tactical and pocket knives. Their products are geared for multiple purposes – military, law enforcement, rescue, and self-defense. They tend to produce switchblades and other folding knives, and I feature one of them in this review. 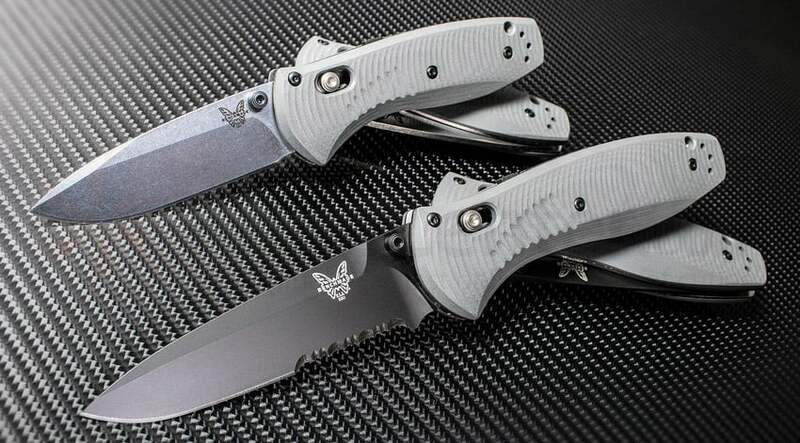 The BKC Bedlam by Benchmade is a foldable-type knife. Having a smaller size, I find this knife easier to conceal than the fixed blade. BKC Bedlam has an overall length of 9.76 inches and when folded, 5.76 inches. For this model alone, you can choose either from a plain edge or serrated edge. If you are a fan of scimitar or curved knives (the tip is pointed upwards), then this knife is an excellent choice. The BKC Bedlam features its very own Axis lock mechanism which makes it a standout among other folding knives. With this mechanism, opening and closing the knife can be done by only one hand. The way it works is a lock made up of a spring-tensioned bar sliding forward and back into the knife handle. The blade is still prone to dulling even though it’s resistive to rust and corrosion (made of stainless steel). For obvious reasons, dull knives won’t do a significant damage when you use it as your weapon. Constant stress deformation will eventually cause the lock mechanism to disengage. So I highly advise not to abuse your folding knife. The handle material is G10 which is known for its exceptional hardness and strength. G10 is composed of several layers of fiberglass cloth that were soaked in resin, compressed and then baked. Studies Observation Group (SOG) started in the mid-80s. They are known as manufacturers of high-quality knives used by various military units and law enforcement agencies. I also find their knives ideal for survival in the wilderness. Some of their products can be considered as one of the best tactical knives today. SOG Gambit is a fixed blade knife with an overall length of 7.30 inches. The blade length is about 2.58 inches; the handle is longer than the blade. This Gambit is a karambit-style knife, evident from its curved shape. The blade points downward if you grip it the regular way. Consequently, it points upwards if you reverse your grip. The blade material consists of stainless steel known for its toughness. Moreover, this material could resist rust more impressively than carbon steel. It has a full tang design so you won’t need to worry about failing lock mechanisms. You can also use this knife for outdoor and agricultural tasks apart from its primary purpose – self-defense. However, the knife is prone to dulling despite the robust build. With that in mind, I advise sharpening your knife in a regular basis. Additionally, there’s a limit to the things you can do with this knife due to its rather small size. If you intend to have something ideal for cutting and slashing in close combat, then this knife will suffice. Other than that, it would be a bit hard. The handle of this knife is made out of glass-reinforced nylon (GRN). GRN is a high-strength and impact-resistant thermoplastic. It also has fiberglass adding to the stiffness. I also find the handle design to be quite clever. Only one side has grooves while the end part has a huge finger hole. With this particular layout, it would be easier for you to change from forward grip or reverse grip depending on what grip makes you more comfortable at the moment. The sheath of this knife only covers the blade and is made of solid molded nylon. As you can see in its name, this knife was originally designed to be used only by the US Navy SEALS. It gives you a hint this one is not your ordinary everyday knife. I list the SOG SEAL Pup under the best tactical fixed blade knives. SEAL Pup Elite is generally used by the military; though it could serve as a great self-defense weapon for non-military people. Out of the overall 9.5-inch length, this knife’s blade length is about 4.85 inches. The convex shaped tip point is an example of clip point blades. You can use the SOG Pup Elite for slicing and cutting with ease. You can even use this one to stab a human adversary! Furthermore, I find this tactical knife ideal for use in everyday tasks. 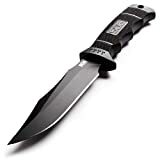 What makes the SOG Pup Elite unique from other fixed blade knives is though the other side is partially plain edge and partially serrated with wide teeth, the spine is serrated from tip to the handle. Not all of it is serrated, though, there’s a straight edge where you can put your thumb if you wish to do so. The knife uses AUS-8 Steel which is stainless. This type resists rust and corrosion quite well. Because of its long length, the knife can easily be spotted so concealing it requires more attention than necessary. However, a lot of people would think twice following you when they see such knife with an attitude to it. Another downside is, this stainless steel knife could easily dull. The grip of this knife is ergonomic and has deep finger grooves. The handle material is of glass-reinforced nylon (GRN). It won’t take you too long to love GRN as its a high-strength and impact-resistant thermoplastic as mentioned just a while ago. Additional perks of the handle is being waterproof and weatherproof. The sheath used for SOG Pup Elite is a nylon sheath with a belt loop attachment. The knife also comes with a lanyard made of nylon that you can insert into the lanyard hole at the end of the handle. Another one from Benchmade, the Mini-Barrage 585 is yet another best tactical folding knife in the market. It came from a brand known for their folding knives that are of high-quality and great value. It strikes a balance on its feature, and as a self-defense weapon, it can surely defend you as long as you know how to use it. The Mini-Barrage 585 has a blade length of about 2.91 inches out of the overall 6.91-inch length. A mere 4 inches in its closed form, I was able to conceal this knife easily wherever I place it. ​There are two versions of this knife you can choose. For instance, you can select between the satin and black finish. You can also make a choice between a full plain edge or a partially serrated edge. The knife features a stainless steel that makes it resistant to rust and corrosion, hence the name of the steel type. I also find the drop point easy to make slash and cut motions without having to worry about breaking it. I also love how I could open the Mini-Barrage 585 with just one hand! Thanks to the assisted lock opening feature that makes this possible. 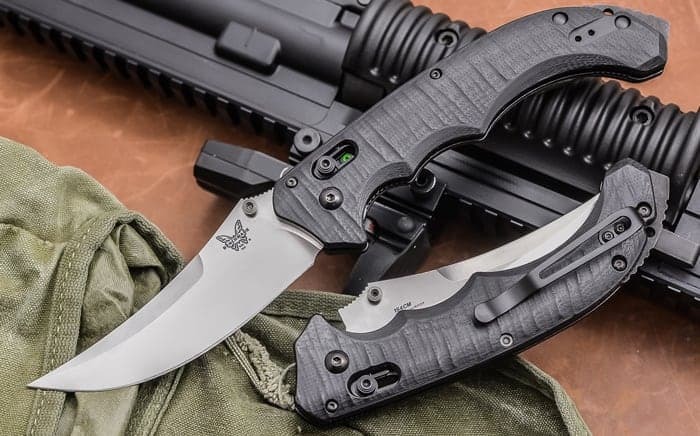 Just like the other Benchmade knife I featured in the article, this one uses its very own Axis Lock, making ambidextrous people (can use both right and left hand equally) rejoice. The hardened steel bar rides back and forth in a slot machined into the liners, and are positioned at the rear of the blade when you open it. Though you can utilize this one for other usage, I suggest you use another knife as a primary tool so your folding knife stays to be what it is for. Constant stress and usage apart from its main purpose will eventually damage the lock. You don’t want the lock to fail when you need it most. Also, the stainless steel which is the reason behind the knife’s rust-resisting feature is also vulnerable to dulling. So I advise you sharpen your knife in a daily basis. I also like the material used for the handle; something that could compete with GRN. It is called Valox. This is also a thermoplastic but molded out of reinforced resin and shows to be very rigid with improved strength and stability. The handle is shown to have parallel ridges on both sides and a lanyard hole. People prefer to conceal their weapons as in some states; it’s a red light to be carrying in open knives that are of a certain length or specific types that function as mere tools to assault another person. It’s the responsibility of the wielder to know how to use his self-defense knife because it’s pointless to be carrying it if he doesn’t know otherwise or can’t be accessed quickly. People who should carry self-defense knives are those who train in knife fighting. Knives are originally used primarily as tools before they were considered as weapons. People use knives for everyday use like cutting, hacking, chopping, and slicing anything the blade can. As weapons, knives are pretty dangerous because they can deal damage that can even result in death. Death by knife is not quick; the person suffers from blood loss first, leading to organ failure. A wound caused by a knife may need stitches at the minimum. There’s a discussion whether knives originally designed as tools are enough to be weapons and whether knives mainly designed as weapons can also be used as tools. The answer to the former is yes, and to the latter: not all the time. Knives like utility knife and a kitchen knife are both used to cut and slice things like ropes, meat, and others; meaning they could be improvised weapons. However, it would be hard to use double-edged knives as utility tools because knife handling like putting a thumb on its spine would result in injury. Daggers are good examples for the second comparison. There are a lot of factors you need to think about when choosing a new knife. Your selection is crucial considering it would be your companion in life and death situations. The type of knife you will be using must be able to protect you and could help you put up a fight. A self-defense knife you can’t access quickly is naught. Especially when an attack against you is staged at a fast turn of events, a knife you can’t draw quickly will make you a vulnerable victim. Your wardrobe also heavily influences how you conceal your knife. For instance, women who dress in skirts, fitting shirts, and dresses have a hard time carrying a weapon as it could easily catch an eye. That’s why, when you plan to bring your knife, you should wear loose-fitting clothes and long jackets. Remember, a weapon you can’t conceal effectively is bound to be seen by some local law enforcement. No matter how valid your reason is, they will find such act (carrying a weapon in the open) to be reckless and irresponsible. You may even be fined or sued depending on the regulations of the area. Concealment and accessibility go hand in hand together. If you’re able to conceal it but can’t access it quickly, you will be a sitting duck. To avoid that, you should position your knife opposite to your dominant hand. For instance, if you’re right-handed, you should conceal your knife in your left breast pocket or the left side of your waistband. There are various types of knives with their lengths varying from each other. The size of the blade you carry should reflect its primary purpose – that is to defend you. 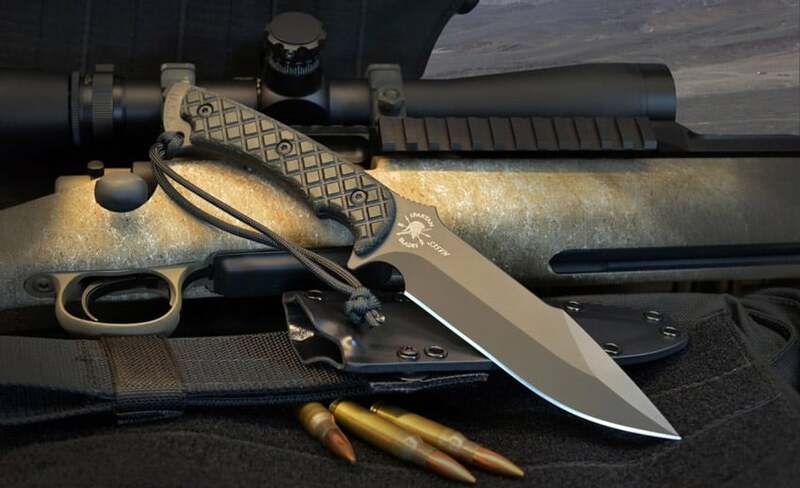 It is said an eight to a nine-inch tactical knife is best used as a hunting knife or part of your survival gear. However, it obviously shows out like a sore thumb if you make it as your self-defense knife. Several areas have laws regarding limits in lengths allowed to carry and conceal. The ideal blade length recommended by most enthusiasts is three to five inches. When it comes to self-defense, there are specific types of knives frequently used – fixed blade knives and folding knives. Fixed blade knives have their pros and cons. They are quite durable and typically have more functions than other types. The length of the blade for this type vary; the longer ones can be tough to hide. For self-defense purposes, a fixed blade knife you should have is something you can fit inside your waistband for effective concealment and when doing so, without sacrificing your comfort. Folding knives have their blades ‘foldable’ and wrenched inside their handles, hence the name. The most common type of folding knife is a switchblade; wherein the blade will spring out at a push of a button. Folding knives are portable and can be carried inside the jeans’ pockets as they take up little space, unlike fixed blade knives. However, in the long run, their handles can become edgy that you can injure yourself. But, this kind of situation can be prevented if you take care of your folding knife. There are also special types like the Karambit knife. A karambit knife has its blade curved reminiscent of the claw of tiger. It’s an effective self-defense tool as its unusual shape, from the blade to grip, can make deep slashes that will bleed profusely. For every folding and fixed blade knife, the orientation of the blade varies depending on the maker and its function. Basically, the knife should have a cutting edge and a point. The tip should be robust enough to withstand the impact if you were to hit a wall or something hard. Since it’s a self-defense weapon, the tip should be able to pierce through human’s skin. Otherwise, you will have to do only slashing, which is proven to be difficult. A drop point blade type is the most common knife tips that are not only found in combat knives but also in survival and hunting niches. Its shape is convex and a sloping spine down to its tip. Drop-point blades make use for controlled cuts and can resist from breaking. However, if used for piercing, it’s not as good as clip point or spear point blades. Next to drop point blades, clip point has an appearance of the spine near the tip being straight or convex. The tip of this blade can make controlled cuts and could easily stab or pierce because the tip is sharper and thinner than drop point. Cons for clip point blades, however, is its prone to breaking. Spear point blades appear symmetrical. The blade’s tip is located at the center and is popularly known as a throwing knife. Just like clip point blades, this one can pierce or stab effortlessly. But unlike clip point, spear point is more durable. As for cutting and slicing, it’s not as good as the other blades. Needlepoint blades are double-edged and can cut on both sides. Its tip is located at the blade’s center. This is an excellent self-defense weapon known for its stabbing and thrusting capabilities. However, since the tip is sharp but thin, it can break if it pierces hard objects. Tanto blade shape is reminiscent of the Japanese sword, katana. The tanto point is known for its versatility and could cut through many objects by a large force. This blade can pierce, slice, and stab – perfect for self-defense. The serrated blade shape is suitable as a tool because you can use the serrated edge for slicing objects like ropes and trees that have uneven textures. However, they can be difficult to sharpen. The handle of the knife makes a good tool and a weapon. If you didn’t feel a good grip on your knife, it would be harder to protect yourself in a fight. Since the tactical knife is to be an extension of your body, ergonomics must be one of your priorities in selecting the best knife for self-defense. The handle should not have any sharp points and still feel nice on your grip whether it’s a forward or reverse. Knives with deep grooves can be uncomfortable if you tend to change your grip often. The contours or ridges must basically feel familiar to your touch and not be extensive. A knife handle can be made from different materials ranging from composite plastic to wood to stainless steel. In selecting the best folding knife or the best fixed blade knife, the handle must not absorb moisture that it reduces your gripping force, shrink or crack. When wet, the handle should not be slippery that results in accidental drops. Go for handles made of metal or hard thermoplastic instead. In selecting the best tactical knife, you should choose between a high carbon steel and stainless steel. Both are widely used in making the knife’s metal part, but each has their advantages and disadvantages. For carbon steel, it is famous for its unmatched strength and durability. Its sharpness is retained for a long time, but it is prone to rust. If you choose this material, you must be ready to apply oil regularly, so the blade won’t succumb to rusting. Of stainless steel is rust-resistant and doesn’t corrode. However, stainless steel is generally weaker than its counterpart. This means that it is quickly dulled and would need some sharpening session more regularly than you think. The durability of this metal is more impressive than high carbon steel. 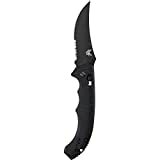 This factor only applies when you intend to pick one from the best tactical fixed blade knives. Full tang means that the metal part of the blade extends to the knife handle. It’s advantageous if your knife has this feature because it’s stronger and won’t break easily. 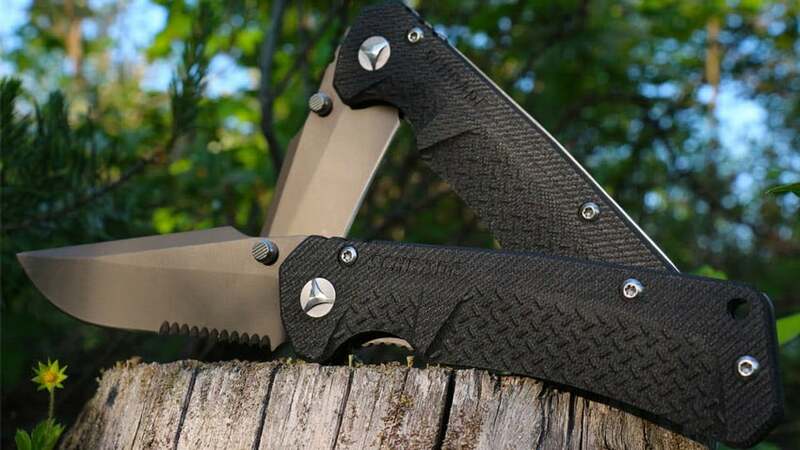 This factor only applies when you intend to pick one from the best tactical folding knives. Without it, your knife can injure your hand needlessly. There are three common types of locks: lockback, liner lock, and frame lock. Lockback is a mechanism where the spine is locked into the notch on the back of the blade. To close it, you need to switch your grip and use two hands to push down the part of the spine to disengage the lock and fold it back. Lockback is reliable and safe to use because your hands aren’t in the way if the blade accidentally closes. The liner lock is common to folding knives today, and its main feature is the side spring bar placed on the same side on the edge of a blade. The liner lock is good when you only need to use one hand in gripping the knife. In closing it, just have your index finger push the blade down slightly and make enough space to move your thumb away from the path of the blade, then close it back to its housing. The disadvantage, however, is that the lock can disengage from constant day to day use. Make sure you don’t use your self-defense folding knife on mundane tasks. Frame lock mechanism is almost the same with liner lock except for the spring bar. Instead, the former has a separate metal liner found within the interior of the handle. This makes the frame of the knife as the lock; folding the knife is in a similar fashion as with liner lock. As a self-defense weapon, your knife should also go wherever you go. With that in mind, it should have a sheath or scabbard, so you don’t wound yourself concealing it near your body. Recommended sheaths are those made of KYDEX, a durable thermoplastic that surpasses both leather and nylon sheaths. The sheath for the knife should perfectly fit the weapon without any room for unnecessary movements. It should fit comfortably and should make it easy for you to draw your weapon in a few seconds. With the best self-defense knives listed in this review, you now have a narrowed, carefully filtered selection on what to choose based on your preferences and needs. With proper training in knife fighting and constant vigilance, you can fend off for yourself. I hope this article has greatly helped you select your partner in self-defense! I carry a Kabar TDI knife. It reminds me more of a Kukri than a Karambit.